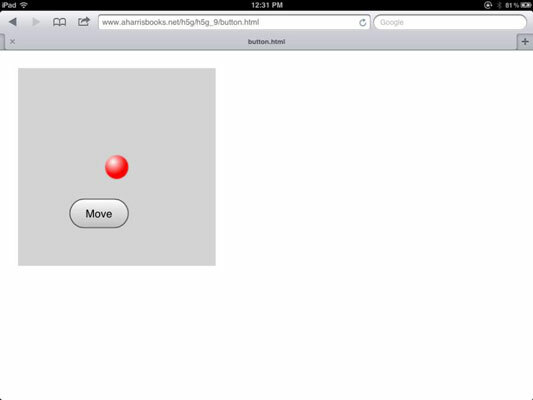 The simpleGame library has a handy feature called the GameButton for adding a button to the screen of a mobile device for your HTML5 game. The keyboard is one of the easiest ways to get input in a standard browser, but most mobile devices do not have keyboards. The first problem is to figure out how to get user input when there’s no keyboard. Create a variable for the button. Like any other game element, you begin by creating a variable to refer to the button. Build the GameButton object in the init() method. The single parameter indicates the button’s caption. Set the button’s size and position. Check button status during update(). Just as you normally check keyboard status during the update() function, you can also call a function to check your button status. Of course, you’ll need to write this function. Read the button’s isClicked() method. If the button is currently being pressed, the value of isClicked() is true. If the button is not currently being pressed, isClicked() returns false. Use this method to determine the current state of each button and act accordingly. Treat a button much like the keyboard. Because testing the buttons ultimately returns Boolean (true or false) values, checking for buttons usually feels a whole lot like checking for the keyboard. Consider adding buttons only when necessary. If you want, you can design a game to display (and test) buttons only when a touch screen is available. The Scene object has a special variable called touchable. This variable is true if the library senses a touch screen, and false otherwise. You can use this variable to generate a custom interface that adapts to the playing environment. Normally, you’ll add several buttons to your interface, one to replace each key you expect the user to use (for example, arrows and the space bar). In this way, you can create a virtual keyboard on the screen. You may need to test the size and position of each key to get a comfortable gameplay experience. Note that the caption of the button is ordinary HTML, so if you want to make your buttons based on images, you can simply add the appropriate <img> tag as a button caption.